As many new lawyers struggle with large law school debt, those wanting to pursue careers in public service law are faced with a tough decision. Do I take a job with a higher salary to pay off my law school debt or do I follow my passion at legal aid and worry about struggling to make monthly loan payments? 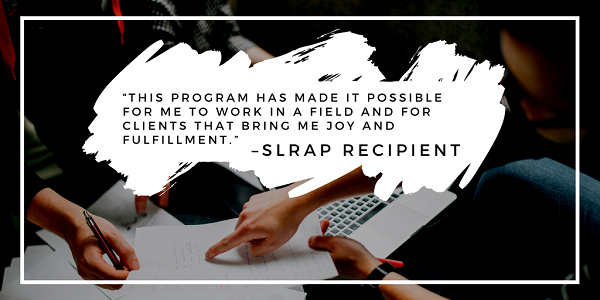 The Texas Student Loan Repayment Program (SLRAP) helps those choosing to pursue careers in legal aid in Texas. A record number of 183 lawyers are receiving assistance from the Texas SLRAP in 2017-18. The generous support of the State Bar of Texas makes it possible to fund all qualifying applicants up to the maximum monthly loan amount of $400. The lawyers taking part in this program have an average student loan debt of $173,872 with annual average salaries of approximately $57,000. The Texas Access to Justice Commission first created the Texas Student Loan Repayment Assistance Program in 2003 to encourage and enable recent law school graduates to work for Texas legal aid organizations and to assist legal aid programs in retaining experienced lawyers. The program is now administered by the Texas Access to Justice Foundation (TAJF) with an application period in the spring and in the fall. To be eligible for the Texas SLRAP, an attorney must work full-time for any Texas program that is a recipient of Texas Access to Justice Foundation (TAJF) funds, a recipient of Legal Services Corporation funds, or a Texas non-profit that provides civil legal services if at least 50% of the services provided are free to Texans whose income is 175% or less of federal poverty guidelines. The 2018-19 application period for the Texas Student Loan Repayment Assistance Program is now open for eligible applicants. The deadline to apply is 11:59 p.m. on March 27, 2018. The Texas SLRAP is a critical part of increasing access to justice for low-income Texas families.